Investing is a crucial part of ensuring your financial future. However, many investors make mistakes that cause them to miss out on the opportunity for investment success. This is why having a financial advisor to guide you through investment planning is wise. A financial advisor with the right expertise can help ensure that you make the most out of your investment plan. 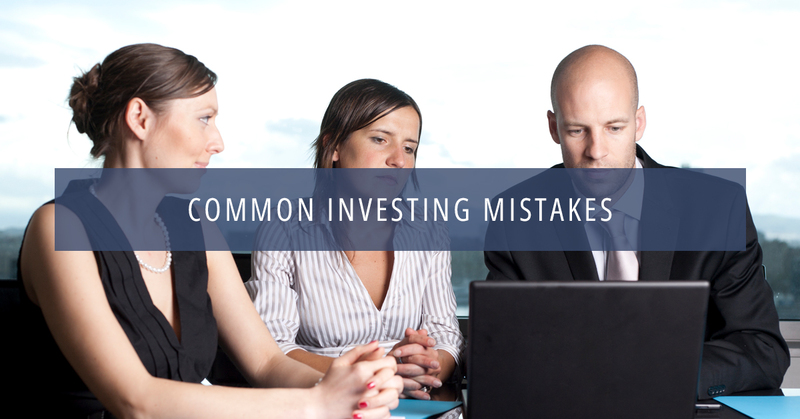 In this blog, we will outline some of the most common mistakes made by investors so you can try to avoid them. Goals: What are you trying to accomplish by investing? Are you trying to accumulate a certain amount for your child’s college fund or for your retirement? Be specific. Risks: Consider what risks are significant to you at this time. Saving for your retirement in your 20s, you may not worry as much about volatility. On the other hand, if you’re near or already in retirement, volatility may be a chief concern. Benchmarks: In order to know if your investment strategy is working, you need to have benchmarks of success. Your investment plan should include benchmarks that allow you to measure how the portfolio, asset classes, and individual funds are performing. Asset Allocation: Your investment plan also needs to outline what percentage of your portfolio you will allocate to bonds, international stocks, U.S. equities, etc. It is important to consider diversification when allocating your assets. Allocating between different asset classes is the first step to diversification, then making sure there is diversity within each class. For example, for stocks, this can mean ensuring that your assets are distributed between small, mid, and large cap stocks, as well as among value, core, and growth stock names. When you are investing to accumulate money for the long term, there is no reason to focus on the movements of the stock market over short periods. If you are saving for retirement and that isn’t going to happen for another 30 years, your asset allocation should reflect that and not be focused too much on the short term. The time horizon for your investments should be accurate to when you will actually need those funds. There are many financial news shows, newsletters, and websites that will claim that they have the answer to your investment success. Often, the advice that they give can have little value. Consider this: if these people truly had the secret to making you a million dollars, would they tell you? No, they would keep it to themselves and accumulate millions, not try to make money off of other people with a newsletter. Spend less time consuming financial media, and more focusing on making the most of your investment plan. It can be tempting to choose asset classes, funds, and strategies because they have recently been performing well. When performance is good, you may fear that you will be missing out, which can lead to rash investment decisions. If a fund has been doing well for the last three years, all you know is that you should have invested three years ago. Going forward, you do not know how well it will perform. In fact, this great performance streak could very well end soon. Stick to your investment plan and be leery of chasing performance. At Advanced Wealth Advisors, our extensive experience allows us to help you avoid many investment mistakes, in addition to the ones listed in this article. Contact us now for a financial advisor in Naples!